How Can You Improve Your Smile with Dentures? Dentures allow you to replace your missing teeth and regain your dental function, beauty, and confidence. These specially-made dental appliances consist of artificial teeth secured to a removable frame or a permanent dental implant. They can last for over a decade with proper care, so you should consider them if you’re looking for a better smile that lasts for years. Will You Have a Choice of Dentures? Dentures are no longer one type for all and there are now several varieties based on your personal preferences and dental needs. Our dentist will perform a complete evaluation to determine your denture options and will help you select the best variety for your smile. Are Full Or Partial Dentures Better for You? Full dentures are sometimes called complete dentures for the way they replace a complete set of teeth in your bottom or upper jaw. With a full denture, your remaining teeth will be extracted and a temporary denture will be immediately supplied. After a few months of healing, you will be fit with your permanent denture which can be either a removable one that rests on your gums, or a fixed full denture that relies on dental implants as anchors. Partial dentures get their name because they let you preserve your healthy teeth, yet still replace any teeth you’ve lost with a bridge-like framework. These are permanently secured to surrounding teeth like bridges, but only connect to the adjacent teeth with clasps. Their removable nature allows you to take them out and clean them every night. Should You Opt for a Flexible Partial Denture? If you don’t want the bright metal clasps and very rigid base of a traditional partial denture, then you should consider this version. This denture is formed out of a very light, bendable substance for maximum dental comfort. And, its softer clasps and base match the color of your gums, so the fact that you’re wearing dentures will remain your little secret. Are Implant-Supported Dentures the Proper Option for Your Needs? Rather than have a traditional denture that loosely lays atop your gums, an implant-supported denture gets attached with two or four dental implants. Typically, these dentures are only used to replace your lower teeth because your upper teeth don’t demand the stability of implants. To keep this kind of denture in good condition, it must be taken out and cleaned each night. Do You Want All-on-Four Dentures? If you prefer the greater ease of fixed dentures with more chewing power, then this type of denture may be the right choice for you. It involves an advanced implant technique that provides a full set of replacement teeth with only four dental implants in the bottom jaw. Your personal denture procedure will be determined by your overall dental health and the denture you choose to get. The usual process begins with your dentist measuring your mouth and making a dental impression to make sure the denture fits well. Afterward, any unhealthy teeth get removed and you are given a temporary denture to wear until the final denture is made. Yet if you get implant-supported denture, your dental implants will be embedded at this time instead. As soon as your full or partial denture is produced, our dentist will place the denture and adjust it for your comfort. Where Can You Get Affordable Quality Dentures Near You? 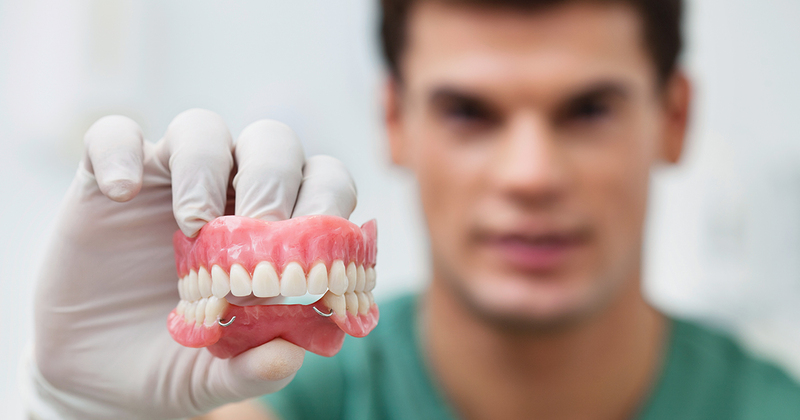 Look no further than our practice for customized, effective dentures designed for any budget. Since the dentures cost is determined by the type chosen and the amount of preparation required, we can’t give you a final price until our dentist has examined your teeth and gums to determine your dental needs. Our practice is known for providing a wide range of affordable dentures in Bradenton and we can do the same for you. Please contact us for a consultation to discover your denture options. Is a Soft Denture Reline the Right Choice for You? A soft reline is made of a flexible and durable material instead of the common rigid acrylic lining material of a traditional denture. This eliminates any risk of dental pain and discomfort suffered with a traditional acrylic denture. Discover how a denture can restore both your teeth and your quality of life. Call our dental practice today to learn more about your options for affordable quality dentures.